This review was published in the latest issue of Proximity Magazine and written by Lilly Lampe. You can read the article in its entirety here. 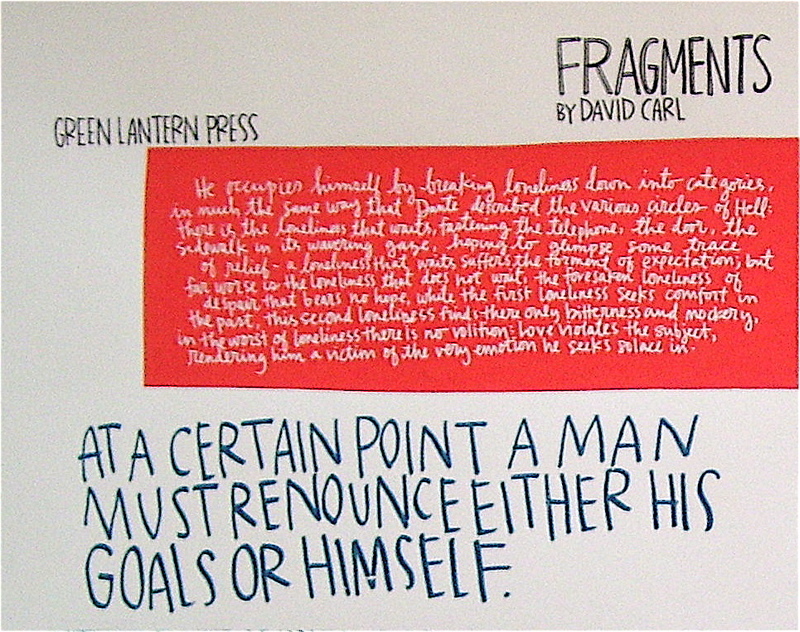 David Carl’s Fragments is a novel told in snippets and vignettes. The sentences follow the reason and order of a man’s explorative and scatter-brained thoughts, and is relatable by anyone who enjoys taking solo walks to air out thoughts (like I do). Fragments is published by Green Lantern and available in that gem of a gallery in Wicker Park. Carl’s novel in pieces detonates the preconceived novelistic form and collects the shrapnel and shreds of this glimpse into a literary relationship in a form that is perhaps a more accurate depiction of a train of thought. The sole characters, He and She talk, or not. The following is the opening of David Carl’s Fragments, available for purchase here. There was no desire for arrival. The furniture, like the weather, changes without anyone noticing. The dwindling time between arrivals and departures drew her attention to the outdated calendar, an ancient time-map in which she had lost her way. She navigates among the geography of shadows. Once upon a time there were any number of alternatives. They share a chapter in the history of tingling. He likes the circles and curves and arches of uneven thinking. Call flesh the name of angelic letters. Neglected ear charting for itself a course across their daily sounds. As if by so feeding his brain some conjugal growth might visit itself upon him. Comestible language might ooze off the page through the ravenous stretches of mind reaching out. Vistas he knows exist and yet fails to grasp. That the mind is but gently balanced and with the slightest nudge might topple from its isolate pedestal like Milton’s proudest Satan, into a pit of knowledge unknowing. That the alchemy of language might turn leaden thoughts into golden vistas of thinking. Part of them emerges on the other side of something they know not what nor begin to guess its thickness. Language laps at the edges, spills over the boundaries, washes away the barriers, and yet still they remain confined. For example: skin and poetry. Blood remains the most complicated language. What about the fact that we have decided to allow the combination of approximately two dozen consonants and half a dozen vowels to represent everything we are capable of thinking, feeling, and imagining? Thought’s efforts to no longer be thought. An obsession bordering on the religious. No book can live up to a person’s desires because books are only records of other people’s desires (and whether these books stem from abundance or indigence, what one takes away from a book always depends on what one brings to it). As if your eyes were the page on which the story of my own eyes were written. A sphere out of control. Man imitates what he sees and is always ready to adopt desire. He thought of her as one who bore her loss with admirable disdain. She was feeling a bit translucent. From the window they watch a boat floating in a muddy puddle. All of life is a lie in response to the truth that whatever beauty does not end was never there to begin with. A discourse that made no provisions for the future. What she calls poetry is a certain inability to see the world. She sees life as an affair chiefly of pronouns which she can neither order nor use in their proper relationships to people or objects. The piles of fruit in the bowl have no mythology by which to peel them. She threatened to continue striking him over the head with her forms of insistence until he repeated after her the words she feared to speak alone. “If you were a book on a shelf, what two books would you want to be placed between?” she asks. There are objects surrounding them other than the objects they have chosen to surround themselves with. Each turned page an attempt at prayer. Fragments on the backs of postcards sent from a dirty room in Istanbul. Foiled by such preposterous instruments as language wields. “You’re beginning to get a picture of just how non-renewable your resources are,” she says. Shocked at the thought of barns. To find room for everything. There were times like these that reminded them of other times unlike these. The secret terror of those who believe in God is the fear that they are wrong; the secret terror of those who do not believe in God is the fear that they are right. The page is the repository for an organization of words that points away from its own finitude to something more. A full dose of the missile’s accuracy. The “long poem” fills him with fear and trepidation. Still quivering after having been coaxed from beneath the refrigerator. Pierced by a certain knowledge. There was something about the sheets of plastic taped over the outside windows that lent a charming opacity to their interior world. Below the level of responsibility an elevator starts its descent. Bones stacked in piles along either side of the tollbooth. Although this is not “all there is,” that is the misconception that allows them to go on. A case of one hand scratching the other. Waiting for faces to appear at the window. You may have noticed something new on the blog: on the right hand side of the page, below the little search field and under the Blogroll, is a new category: “Our Books”. “Our Books” is not just a scheme to lead you to our catalogue. Well, okay, maybe it is. But it’s more than that, too. I’m in the process of setting up a individual blog for each of our books, with new content, excerpts, reviews, interviews and more. I haven’t figured out what that “more” is just yet, but I’m working on it. Do you like David Carl’s Fragments but absolutely hate The Green Lantern? Well, your problem is solved. No longer do you have to wade through hundreds of Fragments-less posts–go to the Fragments blog and get what you want. Really, though, it’ll be a great way to keep up to date on your favorite books and authors. The content is small at the moment, but it’s growing. And I seem to remember a certain other blog that was only updated once a month or so. So keep checking back. Fragments is a book. Once that has been established (fairly easy, that) everything else becomes difficult. It could find its place in the fiction section of a bookstore, or the philosophy, poetry, or literary criticism sections. None of these designations would be totally incorrect, but they wouldn’t feel especially right, either. A novel lacking true characters and plot, philosophy without an argument, poetry lacking verse, criticism without an object. The one thing each has in common with the other is likewise the thing they all have in common: paper, filled with sentences, gathered and bound, easily shelved. Fragments is a book. Each sentence stands alone, separated by a quarter of an inch white space from the sentences preceding and following it—a more significant stylistic constraint than you might assume. As an extra foot in a line of Shakespeare or an awkward rhyme in a sonnet may shake the reader, an oddly placed semi-colon in Fragments affects the text to a similar degree. There are two characters, a man and a woman, both unnamed. The reader knows so little of their fictional biographies that they can be read as archetypes or even as mere abstract textual pronouns. At the same time however, they have just enough personal characteristics to defy such a simplification (“he freezes at the sight of household cleaning products, she is a maker of lists” ). They interact, but they do so at such a remove from one another as to render the exchange nearly meaningless. When “he” speaks, we assume he is speaking to “her”, but his words are isolated on the page. When she responds, if she responds, it is pages later. Sometimes the sentences are part of this non-conversation and sometimes they are not. Sometimes they are ideas one or the other entertains. Sometimes they are quotes they have read. Sometimes they are thoughts they’ve written down. Sometimes they are exposition. Carl gives few hints about how to discretely categorize and place a sentence, although after a few pages the reader may eventually come to realize that she can is intuiting who is thinking and in what way. And each time a reader returns to Fragments, she will find a different book. When the reader grows comfortable with the book (and like many great books, it is the kind of book that one must grow comfortable with) she will notice that, in many ways, such distinctions are unimportant. Or, at least, they are of secondary importance. Fragments is primarily a meditation on the sentence. The sentence is protagonist. It does what a protagonist does in most novels: views and shapes the world, and is, in turn, shaped by it. David Carl has done well to perform this interrogation of it. Way back when we released our first books, we made video trailers as promotional tools. Or at least that was the idea…saying “promotional tools” is kind of stretching it a bit. But they were, in fact, video trailers. Just like they make for movies. Only we made them for books. (Sometimes this idea confuses people. Even people who work for Poets & Writers magazine. And when we try to explain it, all we can come up with is, “They’re trailers. Like for movies. Only for books.”) We thought we were doing something original but, it turns out, trailers for books is a thing. The term “book trailer” is even trademarked. There’s a whole article about it in Poets & Writers. I’m going to talk myself into thinking that we turned P&W on to this whole thing. Three thousand? Three thousand is the typical number of copies moved for a work of literary fiction? I can’t believe I just quit my day job. When you’re finished with the article, go here for the trailer of David Carl’s Fragments. And let me know if you hear of any job openings. I’m not kidding. bugles, the chips, not the trumpets. on the way there, the steward was making eyes at me. nasty mean ones. as if to say, don’t you dare drop that package of peanuts. the woman in front was trying to gossip. she, window-seat, 65, said to he in the aisle seat, 45, that you can’t drink on flights into ABQ anymore, don’t you know, because last time a fellow drank too much and met his family at the airport and drove them all from the airport, (her voice a trembling reed) only crashed and killed everyone before they got anywhere at all. i watched between the seats–i was sitting behind them—as she leaned into him under the auspices of conspiracy. the man (aisle) next to me referred to me as an 18 year old on his telephone before take off. presumably to his wife. he was calling because we’d been delayed on the ground, and he complained a little, eye-rolling and tetchy. There was something about his indignation that felt at home, and happy even, to have a confessor on the other line. I suspect they had seasonal towels. A weineramer. All this because I went to Santa Fe for the release of Fragments; a new book by David Carl who is also a St. John’s tutor. I landed in Albuquerque and rented a car, listening to AM stations and mariachi bands all the way. It was great. Amazing too to practice the art of new topographies. David Carl read in the Great Hall of St. John’s College, in between various meetings. He’d just gotten back a few days before from sabbatical and was knee-deep in the college all over again. Seersucker and all. 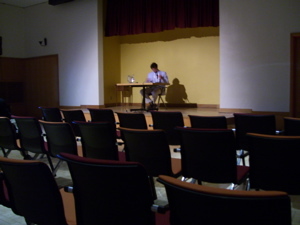 He sat at a blond desk in the front of an auditorium that could seat about 300 or so—it was the end of the semester. The annual party was to commence the next day, Friday, what students on both campuses (Santa Fe & Annapolis) like to call “Reality.” Needless to say, the campus was bustling with the final days of fatigue, anxiety and anticipation. There were about 20 people in the audience and they sat, mostly in couples, in different seats. Taking full advantage, it seemed, of the many options. David Carl had a wine glass of water and ice. It perspired on the desk in front of him, here he sat, his ankles crossed. For the record, he’d also said that he was only willing to lean it on the poetry side of things because none of his poet-friends (whom he later referred to as Real Poets) were not present. The next day, walking around downtown- away from the Plaza with the rabbit skin moccasins, brand new and beaded, everything adobe and dirt brown or rosey: I came across an old Hall of Records. There was an old man taking the flag down and the air was spitting still, the rain a little lighter than it had been that morning. This same building had a wooden plaque running above the old man’s head, and in white peeling paint it said: The nation that forgets it’s history has no future—which was particularly ironic since the adobe walls that held the roof up, the one in particular just below the sign, behind the man, had letters bleached on it’s sides, from where they had been removed spelled out, in dots where once there had been nails or studs: JOSEPH F. HALPIN; RECORDS CENTER AND ARCHIVES. A defunct building crying out against its now uselessness. 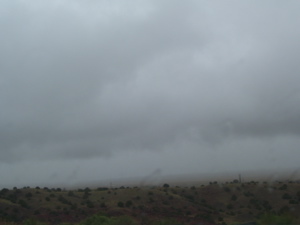 In all that wet, it nevertheless felt like the desert was preening. All of the living things unfurling, at last able to breathe. The dirt released its ozone and the plants took deep breaths, emitting their perfumes. The sudden ecstacy of abundant showers. Thank you to the Stickneys for their wonderful hospitality & St. John’s too for organizing the event.